Modeled after onsite radio and television appearances that we have all seen at car dealers, restaurants and other consumer events, DiPietro spends three hours at the NERVDA members company doing Facebook Live videos throughout the event. He is often able to produce 6 to 7 videos, usually on the hour and half-hour. John is a New England radio and television personality, in addition to his work as a sales and marketing consultant and owner of a media marketing company that produces aerial photography and drone video. DiPietro is a frequent substitute guest for Jordan Levy on WTAG (AM, FM and iHeartRadio). Levy is the former Mayor of Worcester, MA. 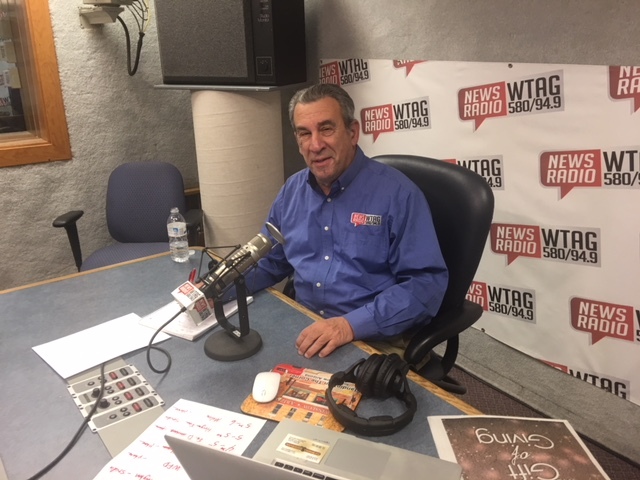 John has also had his own television shows on Worcester and Springfield television stations and enjoys interacting with people in these business settings. Being an active RVer for decades, he also knows how to make consumers and dealer personnel very comfortable during the impromptu videos he does live during the Onsite-Online promotions. DiPietro visited Hemlock Hill RV in Southington, CT for their Open House. Welcome to Hemlock Hill RV – Your key to adventure! With a centralized location in Southington, Connecticut, Hemlock Hill RV is your one stop shop for all your traveling needs! Our Connecticut RV Dealer is ready to provide for your every need with our RV Sales, RV Service, RV Parts, and RV Finance departments! See all of the Hemlock Hill RV videos on their NERVDA video page. DiPietro visited Lee's Family Trailer Sales and Service in Windham, ME for their Open House. Lee's Family Trailer is a family owned RV dealership offering the best selection of high-quality RVs from the best manufacturers in the business. See all of the Lee's Family Trailer Sales and Service RV videos on their NERVDA video page. DiPietro visited Arlington RV Supercenter for their Zero Down sales event. Arlington RV Supercenter is located on 966 Quaker Lane, East Greenwich, RI. 02818. Family owned and operated for three generations! See all of the Arlington RV Supercenter videos on their NERVDA video page. DiPietro visited Diamond RV Centre for their Open House sales event. Diamond RV is proud to be one of only two recipients of the Winnebago Circle of Excellence Award for the motorized division in all of New England! See all of the Diamond RV videos on their NERVDA video page. DiPietro visited Long View RV during their Columbus Day sales event. Founded by Fran and Shirley Roberts in 1959, Long View RV is one of the oldest family-owned RV dealerships in New England. This video showcases multiple generations of the Roberts family involved in running the dealership, now headed by Frank Roberts. DiPietro visited Majors RV for their Open House October sales event. The best parts showroom in New England, and a friendly knowledgeable staff ready to assist you with all your parts needs. RV Parts, Storage for a day, month, or even yearly is available at Major's RV, RV Service, Hitches. Visit their NERVDA Video page here. The very first promotional visit was at Major’s RV Service Center during their Fall Spectacular Savings Sale. Videos included interviews with staff members and suppliers onsite to help out with this annual sales event. View more on the Major’s RV Video Gallery page on their NERVDA page. The Onsite Online videos were taken during their Columbus Day sales event.